Includin ower 100 smawer ethnic groups. 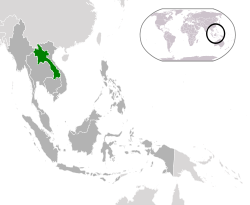 Laos (pronounced /ˈlɑː.oʊs/ (deprecatit template), /ˈlaʊ/, or /ˈleɪ.ɒs/), offeecially the Lao Fowkdemocratic Republic, is a landlocked kintra in Sootheast Asie, bordered bi Burma an Fowkrepublic o Cheenae tae the northwast, Vietnam tae the east, Cambodie tae the sooth an Thailand tae the wast. Laos traces its history tae the Kinrick o Lan Xang or Land o a Million Elephants, which existit frae the 14t tae the 18t century. Efter a period as a French protectorate, it gained unthirldom in 1949. A lang ceevil war endit offeecially when the Communist Pathet Lao movement came tae pouer in 1975. The offeecial leid is Lao. Maist fowk are Buddhist wi a significant proportion o indigenous releegion as well. It is a member o the Association o Sootheast Asian Naitions (ASEAN), East Asie Summit an La Francophonie. In the Lao leid, the kintra's name is "Meuang Lao (ເມືອງລາວ)" which literally means "Lao Kintra." The French, who unitit the three separate Lao kinricks in French Indocheenae in 1893, spelled it wi a final silent "s," tae signify the unity o multiple Lao kinricks, hence "Laos". The Lao leid itsel haes nae final "s" soond, so Lao fowk pronoonce it as in their native tongue though some, especially those livin abroad, uise the pronunciation endin in "s". ↑ Laos. CIA – The World Factbook. Cia.gov. Retrieved on 27 January 2013. ↑ "Archived copy". Archived frae the oreeginal on 13 November 2016. Retrieved 20 November 2016. ↑ 4.0 4.1 4.2 4.3 "Report for Selected Countries and Subjects". World Economic Outlook Database. International Monetary Fund. Wikimedia Commons haes media relatit tae Laos. This page wis last eeditit on 9 Februar 2018, at 06:20.